Why? Why did I lose to Kikyo? What is that pagoda? Did Tsubaki escape into that? That’s Kagura! So Naraku and Tsubaki are in cahoots after all! Oh demon! If you desire the Sacred Jewel, you must obey me! I will attain eternal youth and beauty! An ogre which was sealed in the pagoda. Using the Shikon Jewel, Tsubaki obtained its power. It turns out that we were victims of Naraku's treachery. Tsubaki as well as us. Tsubaki was so obsessed with the Sacred Jewel… But there was no way she would win… Obsessed… Who am I to talk? Toji, the tallest pagoda in Japan. Pagodas, the one used to house the Orge in this episode, are found in Asia, often associated temples and Buddhism. They are believed to offer protection to the temple. It is rather sad that even when Tsubaki was dying, she was still obsessed with her youth and was blaming everyone for her downfall. INU-gang enter the courtyard of the Yin Yang Shrine. INU: Come on out, Tsubaki! KAE: It IS that Tsubaki, after all. KAE: A priestess, 50 years ago, just like my sister, Kikyo. Cut to flashback of KIK and a young KAE walking along a village path. A young TSU comes along in the opposite direction with the Yin Yang Master. As the two groups approach each other, KIK and young KAE step aside to let TSU and her master pass. KIK bows her head low in reference, while TSU walks pass her proudly. Young KAE: Sister, who is that priestess? KAE: (voice-over) I never imagined she would turn to the Dark side. INU: Who cares about the past?! Where is she now?! INU: What's the matter, Kagome? KAG: (pointing) Way inside… I sense the Sacred Jewel. INU: (turns to the direction that KAG was pointing) All right! SAN: What's the matter, Priestess Kaede? KAE: Stories have been passed down, that in this area a demon was sealed away. INU-gang looks at a huge red glow emitting from the forest behind the shrine. INU, SAN, KAE and KAG run in the forest leading to the pagoda. They can see the tip of the pagoda. Suddenly demons appear from the trees. INU-gang halts. HIR slashes some demons into two and the demons turn into paper. SHI is kneeling by a riverbank and refilling some water in a bamboo container. KIR looks on behind him. Cut to MMJ and BOT lying on the grass, unconscious, with wet towels over their foreheads. MIR looks concernedly at them. MMJ wakes. MMJ: (sees MIR, sits up and scampers away from him) You are…! MIR: (holds MMJ's hands) Listen… Will you bear my child? MMJ gives him a 'duh' face. BOT wakes and MIR leaves MMJ to hold up BOT. MIR: (holds one of BOT's hands) Well? Will you bear my child? BOT gives him a 'duh' face. MMJ: (furious) Will just anyone do?! MIR: No, it's not that. SHI: (reach the scene with KIR, in glad tone) Oh, you're conscious. BOT: Yes. (notice SHI) You appeared, Demon! MMJ: (holds up a paper charm) Stay away! MIR: (looking at his left hand) You've mistaken! Shippo has taken care of you all this time. MIR: I was ordered by Kagome and the others, not to touch you. So Shippo has been taking care of you. SHI: (indignant) Maybe it was unnecessary. MMJ: (walks to SHI with BOT) He's not a bad demon? SHI: (turn around, looking hurt and proud) I never hurt humans. MIR's worried expression turns into a gape. Cut to MMJ hugging SHI tightly in her arms, and BOT squeezing KIR in hers. MMJ & BOT: So cute!! BOT grabs SHI from MMJ and squeezes him happily together with KIR. MMJ: (tugs at SHI's bushy tail) Tail! A tail! (pulls SHI's ears) Ears, ears! BOT tries to kiss SHI and he breaks away from BOT, running towards MIR desperately. MMJ catches hold of SHI and pinches his cheeks. SHI: (struggling) Hey, Miroku! Please help me! MIR: (in nice tone) Just put up with it in order to prove that you're not a bad demon. (turns around and sighs, in lowered tone) I'm so envious! MMJ: However… Why do you go after Priestess Tsubaki? BOT: Yes, isn't that Inuyasha a bad demon? MIR: Tsubaki tried to curse Kagome to death. MIR: I don't know what Tsubaki has told you. However, she is a dark priestess now, who curses people. BOT looks at MMJ intently. INU slashes some demons which turn into shredded paper charms. KAE: Yes, that Shikigami was not all that powerful. SAN: Does that mean Tsubaki's power is weakening? KAG: But she has the Sacred Jewel. INU: She probably can't use it properly. Let's go! INU, KAG, KAE and SAN run toward the pagoda. The shredded Shikigami fly up into the sky and towards the pagoda. KAG, SAN, INU and KAE reach the pagoda. SAN: What is this pagoda? KAR: (in the background) The place where you'll die. The gang gasp as the door creaks open and the wind starts to blow. KAR appears at the door and leap a distance in front of them. SAN: So Naraku and Tsubaki are in cahoots! INU: Naraku's with her, huh? Couldn't be better! I'll kill you both along with Tsubaki! A dark corpse, with red eyes and clad in samurai gear, appear at the door and trudge towards them. He makes a growling sound. INU: (scoffs and points TET at the corpse) No problem! This one's just another puppet! INU jumps and attacks the corpse, but he unsheathes his sword and blocks. Static ensues and INU is thrown off. INU: (slides backwards to a halt and scoffs) Hah! I guess he can fight a little. (raise TET with wind vortex) Then take this! INU throws a Wind Scar in the corpse's direction. KAR sends wind blades which breaks apart the Wind Scar. The corpse sprint towards INU and catches him off-guard, and punches him in the face. INU is caught off-guard again and is cut and thrown to the ground by the wind blades. A growling sound is heard behind INU and he looks up, only to find the corpse raising his sword above him. He swings it down but INU gets up in time and dodges. INU leaps backwards. KAR sends mini tornadoes at INU's direction which forces him to land. Once INU landed, the corpse swung his sword at INU's chest. INU winces in pain as he falls and hits a tree. KAG's arrow misses KAR and hits her earring instead. KAR gapes at KAG in shock, then in anger. KAE's arrow fly in KAR's direction, who blocks it with her fan. The arrow breaks into two and one part hits the corpse's sword. The sword flies out of his hand and strikes the ground. INU: (raise TET) Take this! Wind Scar! INU performs a major Wind Scar which strikes the corpse. He growls in pain and disintegrates into many Shikigami. INU: (to KAR) Next, it's your turn! KAR grabs a feather from her hand and flies off. KAR: (shouting from above) Tsubaki's first! KAG: (looks at the pagoda) Inuyasha, I sense the Sacred Jewel! The group enters the pagoda. Inside, a stairwell leads downwards and deeper into the ground. The group examines the stairwell. KAE: There was a barrier here to keep something sealed within. But the seal has been broken. SAN: You mean the Shikigami earlier? KAE: A seal this strong isn't necessary for a Shikigami like that. KAE, KAG and SAN walk down the stairs behind INU. BOT, MMJ and MIR ride on a transformed KIR. MIR sit behind MMJ and BOT, while SHI sits on KIR's head. BOT: Tsubaki is a Dark Priestess? MMJ: I can't believe such a thing! MIR: You belong to the same shrine as Tsubaki, so I don't blame you for not believing. So why not go and see for yourself? MMJ and BOT look at each other. SHI: (thinking) He's having so much fun with this! KIR growls and flies higher. In a dark underground room. TSU is praying. Suddenly she opens her eyes. The rope and seals which are tied around a large stone in front of her breaks loose. TSU: Open, oh demon gates! Come forth, oh golden god! The stone is bathed in red light and cracks appear. It explodes and a pool of red liquid is seen in the rock. Voice: You dared to seal me within! You shall not be forgiven! Never! TSU: I will give you power! I have the power of the Sacred Jewel here! TSU: (a light in TSU's right eye glows) Now, do you not desire this power? A large red hand appears from the liquid. Voice: Give it to me! Give it! The hand reaches towards TSU. Voice: Give it to me! As the hand reach TSU's eye, it is sucked into it. The rest of its body are sucked into TSU's eye too. When the huge body is sucked in, TSU gasps in excitement and clutches at her eye. INU, SAN, KAG and KAE barge into the room. INU: So there you are, Tsubaki! TSU: It is you! I have been waiting. INU: We want the Sacred Jewel back. TSU: Sacred Jewel? I see… This is amazing! KAG: The Sacred Power is in Tsubaki's right eye. TSU: I never imagined it would be this powerful! If only this Jewel had become mine fifty years ago…! KAE: Fifty years, you say? Tsubaki! What happened between you and Kikyo fifty years ago? TSU: Kikyo? You say Kikyo? Flashback of KIK throwing back the Shikigami at TSU, and TSU screaming in pain. Fade to present. TSU: It's all Kikyo's fault! That cold, smug priestess! INU: Don't you say anything against Kikyo! INU winces in pain and falls down. INU: So what's after the demon? Just what are you harbouring in that right eye? TSU raise her red demonic-looking hands and laugh hysterically. MMJ, BOT, MIR, SHI and KIR land in front of the pagoda. BOT: What happened to the pagoda? MMJ: Impossible! The forbidden pagoda gates can't be open! A loud crash is heard and the ground trembles violently. The ground cracks open. 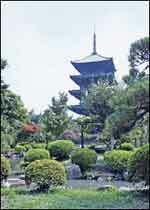 The pagoda collapses and out of the smoke run INU with KAE on his back. KAG and SAN run behind him. A huge red demon in TSU's clothes and with a glow in its right eye appears and growls. TSU-Ogre: (in a voice consisting of TSU and the Ogre) This is the power of the Sacred Jewel! This is the power of the demon! INU-gang are dumbfounded at the sight of TSU-Ogre. TSU-Ogre: What's the matter? Does my power make you speechless? BOT: The seal has been broken! MMJ: That's Tsubaki! She couldn't have broken the seal…! MMJ and BOT acknowledges and runs to the back. TSU-Ogre: (concentrates a ball of lightning in its hand) This power is amazing! TSU-Ogre throws the lightning ball at INU-gang who dodges in various directions. INU: (leaps with TET) Why, you…! INU slashes TSU-Ogre's arm with TET, but doesn't even hurt it. TSU-Ogre hurls INU away. INU lands. SHI: Damn! It countered Tetsusaiga's thrust! INU growls and stares at TSU-Ogre..
TSU-Ogre: It won't work! It won't work! INU: Don't act so smug! (swings TET upwards) Take my Wind Scar! INU sends a Wind Scar towards TSU-Ogre who deflects it which its palm. The rest of INU-gang look on nervously. INU: Why, you…! My Wind Scar didn't work! MIR: That leaves…my Wind Tunnel! MIR opens his Wind Tunnel. TSU-Ogre hurls a lightning ball to the ground which causes a torrent of rocks to fly in MIR's direction. MIR closes his Wind Tunnel immediately and dodge to the side. KAG: (draws an arrow) Why, that…! KAG fires an arrow at TSU-Ogre, which hits it on the arm. It growls in pain. INU-gang looks on nervously. TSU-Ogre then plucks out the arrow from its arm and laughs. TSU-Ogre: You may be Kikyo's reincarnation, but you're nothing much. (throws the arrow on the ground and steps on it) Kikyo was just a priestess who wasted the power of the Sacred Jewel! KAE: What are you saying?! TSU-Ogre: I, Tsubaki, am the perfect match for the Sacred Jewel. Cut to flashback of fifty years ago. Young KAE is looking at the Sacred Jewel necklace in KIK's hands. KAE: Sister, what is that? KIK: The Sacred Jewel. I have been entrusted with the duty to keep the Jewel clean and pure. Fade to a very angry TSU. Fade to TSU-Ogre. TSU-Ogre: (laughs) Fifty years have passed. And at last, the power of the Sacred Jewel is mine! TSU-Ogre slaps INU aside, who crashes to the ground. SAN swings HIR at TSU-Ogre who slaps it aside. TSU-Ogre: More! Even more! The Sacred Jewel can take on even more power! (laughs) There are countless demons who desire the power of this Jewel! I will devour them all and I will grasp power and eternal life! KAE: She intends to use the power of the Sacred Jewel to consume the power of demons. INU: I won't let her! TSU-Ogre: Half-demon, you will also become mine! TSU-Ogre: Inuyasha, aren't you the one? Who made Kikyo lose her heart? TSU-Ogre: The half-demon that Kikyo could not have…I shall devour whole! A gust of wind starts to blow in the direction of TSU-Ogre's right eye. TSU-Ogre: Now then, give up your heart to the Sacred Jewel! INU struggles to keep a foothold in the wind to prevent himself from being sucked in TSU-Ogre's eye. He thrusts TET into the ground to keep himself steady. TSU-Ogre: Why, half-demon! Why do you not give yourself up to the Power? INU: Because you make the Sacred Jewel filthy! Which Kikyo never did! Lightning flashes and strikes around INU. TSU-Ogre: I gave up everything in order to possess the Sacred Jewel! Cut to flashback in the shrine. TSU is leaving the shrine in a huff. Her master calls out to her. TSU: (turns around) No, Master! I am not satisfied! Why did you entrust the Sacred Jewel to Kikyo and not me?! TSU: I, Tsubaki, will not take second place to Kikyo! TSU-Ogre: Know the wrath of my power! Lightning flashes across the sky and strikes around INU-gang. SHI shrieks as a lightning bolt strikes near him and KIR. INU yells as a bolt hits him. INU: That miasma will be your downfall! A wind vortex starts to surround TET. The vortex and the fireball collides. INU: (raise TET) Take this! Backlash Wave! INU swings TET down which sends a vortex at TSU-Ogre, who yells in terror. Mini tornados slashes across TSU-Ogre's body and breaks it into pieces. MMJ: The demon is disappearing! TSU, in human form, is seen falling amidst the pieces of red flesh. TSU lands on the ground. INU looks on. TSU: (clenching her arm and walking weakly, thinking) Not yet…! As long as I possess the Sacred Jewel…! Suddenly, TSU's right eye glows and a Poison Insect flies out of it with the Sacred Jewel, and flies off into the sky. TSU: (chases the Poison Insect) My Sacred Jewel! SAN: You won't get away! SAN swings HIR at the Poison Insect and breaks it into pieces. KAR appears on her feather and catches the Jewel. She sniggers. INU: Why, you! Hold it! TSU collapses to the ground, all old and dishevelled. TSU: (in old voice, weakly) Damn! Damn it! My youth is being sucked out of me. (holds her face weakly) I can't hang on to my youth…! KAG: She aged so suddenly. KAE: Tsubaki has lost the demon powers as well as the power of the Sacred Jewel. She has no choice but to go back to her original form. TSU: Oh, where did I go wrong? Cut to flashback of TSU's previous battle with INU-gang. TSU: (voice-over) Was it that half-demon? Or that Kagome? Cut to image of NAR in baboon suit. TSU: (voice-over) Or was it because I accepted Naraku's offer? Cut to flashback of young TSU with her master looking up at the pagoda. TSU: (voice-over) Where did I…? Cut to flashback of TSU leaving the shrine angrily. TSU: I will not take second place to Kikyo! I should have the Sacred Jewel, not Kikyo! I, Tsubaki…! Fade to present, of an old TSU raising her hands towards the sky proudly. TSU: I, Tsubaki, am the ultimate priestess! TSU disintegrates and a wind blows the ashes away. Her clothes fall to the ground slowly as a sad music plays in the background. MIR: It's the end of the Dark Priestess. INU-gang say their goodbyes to MMJ and BOT at the entrance of the shrine. MMJ & BOT: Please forgive us for our errors. KAG: Don't worry about it. It wasn't your fault. MMJ: So then… Take care, Shippo. A short while later. INU-gang departs. MMJ and BOT wave them goodbye. MIR: It turns out that we were victims of Naraku's treachery. MIR: Tsubaki as well as us. SAN: And the Sacred Jewel is still in Naraku's hands. INU: I'll get it back without fail! KAG: Yes, you're right, Inuyasha. INU-gang moves on. A soft rustling noise is heard in the bushes. INU pauses and turns around. KAG: What's the matter, Inuyasha? KIK is seen hiding behind a tree. As INU walks off, she turns around and looks at him. KIK: (thinking) Tsubaki was so obsessed with the Sacred Jewel… But there was no way she would win… (speaking) Obsessed… (looks down, closes her eyes and grimaces) Who am I to talk? KIK walks away slowly among the trees. What's the matter, Myoga? You usually try to avoid us, but today, you've actually come to us! (gasps) Miroku is attacking Sango! What's going on?! Even Inuyasha is acting funny! Could this be the curse of the giant centipede? Next on Inuyasha: "Farewell Days of My Youth!" Whose youth anyway? eNature on 19 Feb 2008.